Personal navigation device with MP3 support, FM transmitter, Bluetooth hands-free and traffic service features. These days it would seem every other car on the road is sporting a windshield mount GPS device of some type or other. With their stunningly low prices, continual innovation in new features and a lackluster price point for factory option GPS dash units - the uptake in these marvelous devices is unsurprising. 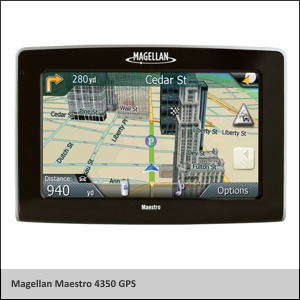 We decided to take the new Magellan Maestro 4320 GPS unit for a spin. The 4350 is a well equipped contender in a fairly saturated market of major players with a plethora of model options. The unit itself is quite slim, with the screen a majority of the frontage, while the back is occupied by a speaker. The mounting bracket attaches and removes easily from the unit and wraps around the back, connecting to the upper and lower edges of the chassis. The black gloss finished front is attractive, but prone to smudges, dust and scratches. The back features a somewhat dated looking grey plastic. The overall feeling of the device is solid, well constructed and durable with exception to the gloss finish. Installation and setup of the unit are no-brainers, pop the unit into a highly flexible mounting arm; plug into your power outlet; answer a few questions and you’re ready. What we liked right away was the slick interface design. Configuration screens, menus, icons, the map screen itself were all stylishly rendered with modern colors, gradients and textures unlike the cartoon-like Garmin and rather dated and inconsistent appearance of the TomTom. Getting around the interface is a snap too... its feature rich but makes the accessibility of these features and commonly performed tasks easy. Specifying addresses, point of interest, intersections or city centers gave us no grief whatsoever. Route calculation times for local trips were almost instantaneous; long haul trip calculation times were quite acceptable. Touch screen sensitivity was excellent, requiring only the lightest touch, but not to the point of becoming counter-productive. Screen glare from sun was sometimes an issue, but generally not overwhelming. The screen is sufficiently matt to help reduce the best it can, the unavoidable fact that direct sunlight will wash out any display you throw at it. And unlike the gloss frontage of the device, the screen seems to combat finger prints and smudges very well. Battery life, through an internal non-user serviceable battery that can be charged by wall adapter, car charger or USB (all of which is thankfully included) lasts roughly 3 hours per charge. Our experience would agree with this statistic, give or take some time, even with route guidance, MP3 music, FM transmitter and Bluetooth connectivity all being used. With our destination set, we were on our way to put this puppy to the test. Overall, we were extremely satisfied with how clear the visual road renderings, arrows indicating turn points, current street information and particularly how amazingly well lane assistance was executed. Lane assistance on the Maestro 4350 really took the guess work out of which lane to be in, when faced with sometimes incredibly complex highway interchanges, ramps and entry / exit systems. It leaves the less than stellar “picture method” the competition uses in the dust. Route recalculations when you go off track were immediate and generally very good with getting you back on track. The text to speech is very clear, with only the very rare occasion where street names are garbled or incorrectly pronounced. Audio directions are concise and well timed giving you plenty of instructions that make turns and road changes simple to navigate. The actual GPS tracking was generally very good. Initial satellite signal acquisition was quick, when coming (for example) from an underground location it relatively quickly picks the signal back up; if turning the unit back on above ground the satellite pickup is literally instant. While most trips you will find an amazing level of accuracy; the occasional trip would make it seem the GPS was having an ‘off day’ being disoriented, unsure of which direction the car was traveling, and a very noticeable deviation between the point the satellite thinks you are and the actual location. Complex road ways or areas which did not have typical road patterns at times complicated the routing unnecessarily, but this was rare. Map coverage includes the USA, Canada and Puerto Rico. The points of interest database features a wealth of restaurant, gas station, service station, parking lot, stadium and other such data that is incredibly handy. The ability to see service station stops during long highway drives at the click of a button in real time is very useful. The AAA and Magellan point of interest data is richly detailed and well implemented. It even offers the ability to directly call through Bluetooth the phone number of the point of interest straight from the POI details screen. Traffic information is fed in by a subscription based service that you must join and pay for monthly, which provides real time traffic data to the unit that helps in routing detours around heavy traffic. Competitors such as TomTom offer this for free; we would have liked to see Magellan match this. Unless you use the integrated FM traffic antennae plug that is integrated to the power cable, it unattractively hangs on your dash. We would have preferred a different method to this design. In addition to the obvious navigation capabilities of the GPS unit, it also sports some heavy weight features that really make this unit a comprehensive device. Bluetooth wireless connectivity allows you to use the Maestro 4350 as a hands free device for your mobile phone, so you can talk hands free, use a built in address book for quick dialing, and even enter and receive text messages through the device. In practice however, the Bluetooth implementation was very unreliable. Our Samsung Jack II test phone had difficulties connecting and paring with the Maestro; often had problems auto connecting afterwards; and many times simply refused to connect. When connected, calls were generally clear for both parties, and the on-screen display and controls were thoughtfully designed. Text message support was almost non-existent for many phone models, which is a shame because it looks to be well implemented interface wise. Mobile phone compatibility is limited to a chart of pre-tested phone models, phones outside of this scope are a gamble. Even when tested there was a complicated matrix of features of what the various phones were or were not capable of. Unfortunately the unit most likely suffers from the limitations and non-uniformity of the Bluetooth technology and how the various mobile phone brands implement it into their various models. A built-in media player adds entertainment for your trips with a built in audio player and video player. The built-in SD slot lets you play files directly off your SD cards which is incredibly handy. The unit is compatible with up to 2GB cards; its lack of 4GB card support and problems with high speed cards are a disappointment. The audio player features support for MP3 and Windows Media audio files. The player is well constructed, allowing for play lists, a clear player controls screen and ability for tracks to be played in the background while in map view. Music file support can sometimes be sporadic, with some files playing perfectly while others unable to load - with nothing in particular seemingly to be the cause. The video player is completely hopeless, and was certainly an afterthought. Video file format support is almost non-existent and we were unable to successfully get any videos working (and from the sounds of it on the discussion forums online, we are not alone). What makes the Bluetooth phone support and MP3 support great is its built-in FM transmitter feature, which is sorely missed on many other GPS units on the market. Beautifully implemented, you choose the station and the audio from the unit comes through clearly from the FM radio in your car. Playing music, listening to directions and using your phone is just so much infinitely better when you can hear and control it all through your car’s speaker rather than the under whelming built-in speaker GPS units typically include. Some people, depending on the area they are in and car model, may need to play around with finding the right channels for best reception. While we had an almost flawless experience with it, others comment on the web that they have had problems. Again, like Bluetooth, this issue is really a result of the inconsistent quality of FM radio technology itself. The Maestro 4350 also features armfuls of small but useful features...Audible and or visual speed warnings, which worked well in the USA but were absent on Canadian roads. A button to quick access custom locations presets and an SOS current position data feature are located at the top left. Easy access to phone and music functions is available through prominent buttons along the bottom of the interface. Automatic day and night modes make night driving with the unit very comfortable as it renders map screens and screen brightness settings less conspicuously in the dark. Based on satellite time data and map data where tunnels are located, it switches modes automatically. 3D building renderings are shown in major cities that in many cases were surprisingly well detailed and had a perfect blend of adding visual appeal and usefulness while still keeping the maps clear and unencumbered. Updates of the unit’s firmware and operating system are both highly recommended and easily performed through software that checks the Internet for the latest updates and a USB cable to your computer. Our praise for the Maestro 3250 is high, however we do have some gripes - some big, some small. Our biggest problem with the unit is its unreliability and inconsistent stability. To put it into perspective... the unit crashed before we could even get out of the parking lot of the store we purchased the unit from. It didn’t end there. We found that there would be occasions (although rare) where the unit simply freezes or crashes, requiring a complete hard reboot of the unit. These events do not seem to be tied to any particular cause, but rather random in nature. Additionally there are very frequent shudders in performance, causing very brief lockups in the order of a half second to second. During these hiccups, map renderings halt and more annoyingly MP3 playback is interrupted. This most typically happens when driving slowly or stopped in areas partially obstructing satellite line of sight such as downtown and urban areas. It is annoying particularly when trying to listen to music and audio books. Again, we recommend the firmware updates as this helps to lessen the reliability problems – we hope further advances are made with future updates. Overall, we were truly impressed with the execution, functionality and overall presentation of the Maestro 4350. It’s a great companion to have along for both your day-to-day local travels, and your long haul out of town trips. It offers solid navigation; in-depth point of interest information; on the road entertainment; hands free calling and a wealth of other features for a particularly attractive price point. We would like to see improvement in the reliability of the device. The device is somewhat a victim of the technologies it depends on such as Bluetooth, a Windows CE underpinning and FM transmission of audio. But we also believe some the stability issues are avoidable through proper quality control. We would recommend this unit to anyone looking for a device with more than just standard GPS navigation capabilities, but a complete range of convenience features and capabilities. The unit is available at electronics retailers across North America with a recommended retail price of $299.99 USD (discounts are often available through retailer sales). Has a standard one year warranty, with a refurbished unit as replacement for defective devices. •	This model has essentially been superseded by the 4700 series.